Using modern technology for early diagnosis of oral cancer for Woburn residents. Did you know your Woburn dentist could help identify the early signs of oral cancer? Oral cancer is a very deadly disease that affects people of all ages, regardless of whether or not they use tobacco or drink alcohol. One out of every four of the 30,000 patients who are diagnosed with oral cancer each year have no history of using tobacco or alcohol and have no other lifestyle risk factors. That means that although there are preventive measures that can help reduce the chances of developing oral cancer, no one is immune to the disease. Early oral cancer detection is key to surviving the disease, as more than half of patients diagnosed with oral cancer die within five years of receiving a diagnosis. However, those rates are drastically reduced for individuals who find cancer in its earliest stages. Nine out of ten people who find oral cancer early will beat the disease – and usually with much more ease and less invasive treatments than individuals who do not discover cancer until it becomes more progressed. At Dental Health Care of Woburn, we offer regular oral cancer screenings using modern ViziLite technology. These screenings can detect early signs of cancer and help you prevent this disease from becoming more severe. I cannot thank Dr. Trainor and staff enough for making my entire experience a pleasant one. From the moment I walked in, I was greeted with smiles and compassion. Dr. Trainor took his time and explained in great detail every step of the procedure, and I was made as comfortable as possible to ease my anxiety. Efficiently and gently searching for cancer. 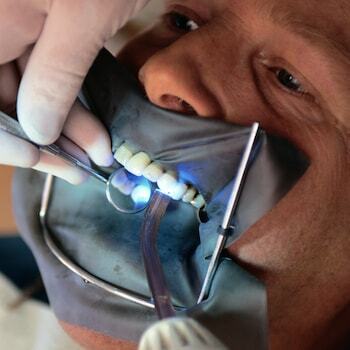 Until recently, dentists had few options for screening for oral cancer. A typical cancer screening included a visual inspection of the mouth for abnormal textures, discoloration or unusual growths. Often, by the time cancer is visible on the surfaces of the mouth it is quite progressed and requires invasive treatments that have no guarantee of success. Now, dentists have ViziLite, an advanced technology designed to identify abnormal cancer cells in their earliest stages – long before they are visible to the human eye. A ViziLite exam consists of rinsing the tissues in the mouth with a specially designed cleansing solution. At that time, the lights will be dimmed, and your Woburn dentist will wave the ViziLite over the soft tissues in the mouth. In most cases, the tissues will appear dark, indicating a healthy, cancer-free mouth. However, sometimes the tissues will turn white, indicating the presence of abnormal cells which may be pre-cancerous or have already progressed to cancerous cells. ViziLite exams are pain-free and require very little time to complete. They use the same technology used to detect other soft-tissue abnormalities in other areas of the body and have been widely successful in detecting oral cancer. 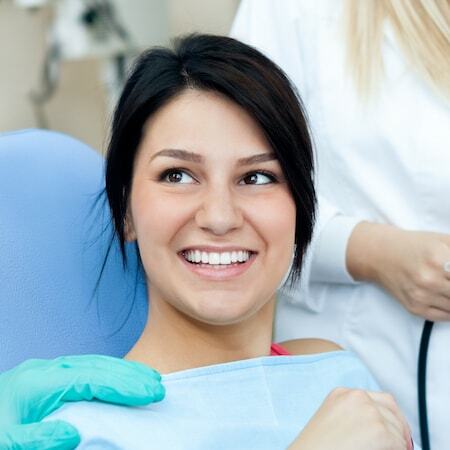 Ideally, a ViziLite exam should be given at a dental health check-up at least once per year. More frequent exams may be recommended for individuals with an increased risk of developing the disease, such as smokers, tobacco chewers, and individuals who consume alcohol at least once per day on average. Although no one wants to think about the possibility of being diagnosed with mouth cancer, regular oral cancer screenings – both visual and using the ViziLite technology – could be life-saving. Early oral cancer detection dramatically improves prognosis, increasing the chances of survival, and also reducing the cost of mouth cancer treatments in comparison with those required for more advanced stages of oral cancer. Our Woburn dentists are here to answer any questions you may have and guide you through the best treatment options for you. Please contact us for more information about oral cancer screening.